It feels so good to say that I finished this quilt! I have spent many, many hours on it, pushing my design skills, piecing skills, color selections and quilting. I am quite happy with the results minus some sewing machine tension frustrations. I love gardening, as most of you know by now. Flowers just get me every time. But I haven’t really made a flower quilt. 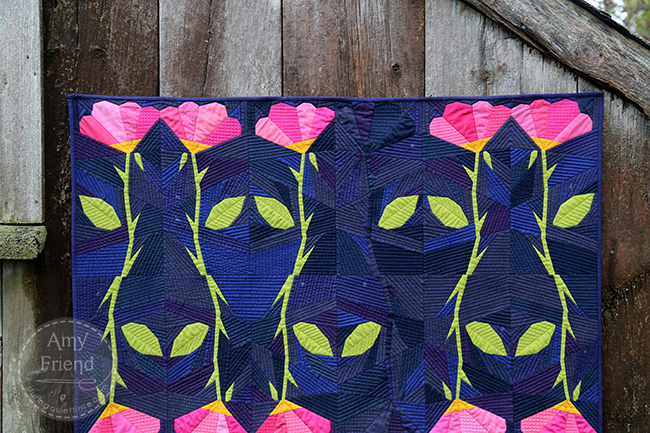 I think it’s because most flower quilts are simply pretty. I wanted to make one that was both pretty and modern and graphic. My flowers are not meant to represent a real variety. I added the thorns for interest more than to suggest roses. I went really scrappy with the petals using multiple shades of pink leaning toward apricot, all pulled from my stash. The center bits are a golden yellow and the stems, a lime green. Along the same lines as my last quilt, I decided to piece the background sections in different fabrics. In this case, there are about 6 shades of deep blue. The colors were chosen for a romantic, midnight garden feel. That’s why I am calling it the Juliet Quilt (as in Romeo and Juliet). I fiddled with the layout over and over until I arrived at this one that is balanced but interesting. I didn’t use any color for the flowers in the fourth column, only piecing the leaves in green. The stems and petals are all pieced in background fabric. 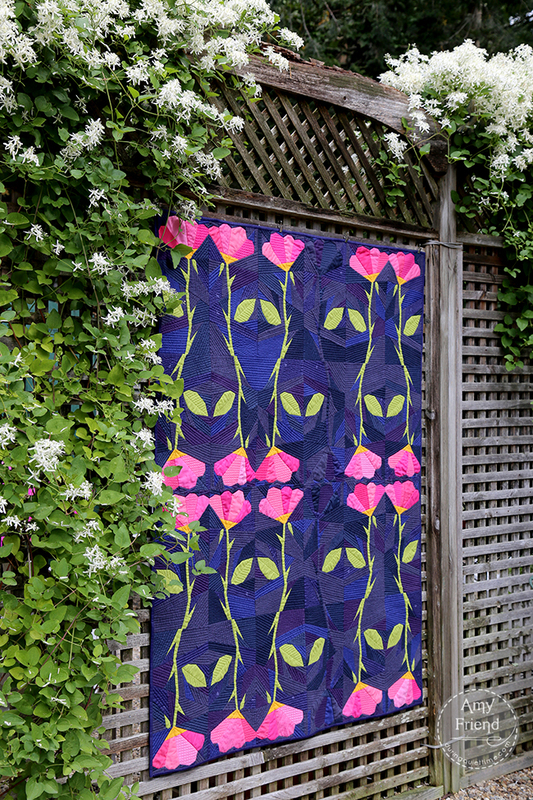 Those flowers are quilted just the same as their pink counterparts. I love that little detail. I am not sure that most people will notice that the 4th column is pieced…but I will! As you can see, I straight line quilted the entire quilt. The background sections are quilted with a coordinating shade of Aurifil thread with lines spaced about 1/4″ apart, in different directions in each pieced section. I didn’t quilt the stems in order to make them pop. I only quilted half of the leaves so that the other half would pop, like the stem. I stitched in the ditch around each petal and crosshatched within one or two petals per flower. Each yellow section has three quilted lines, in a shape that reminds me of a chicken foot! 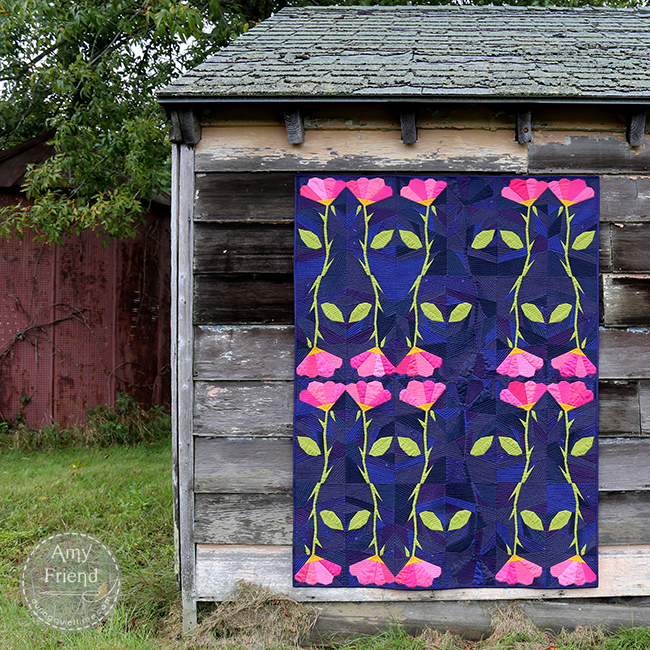 I selected a gorgeous Anna Maria Horner print for my backing. I am shocked that I can still make out the print with all the quilted lines! 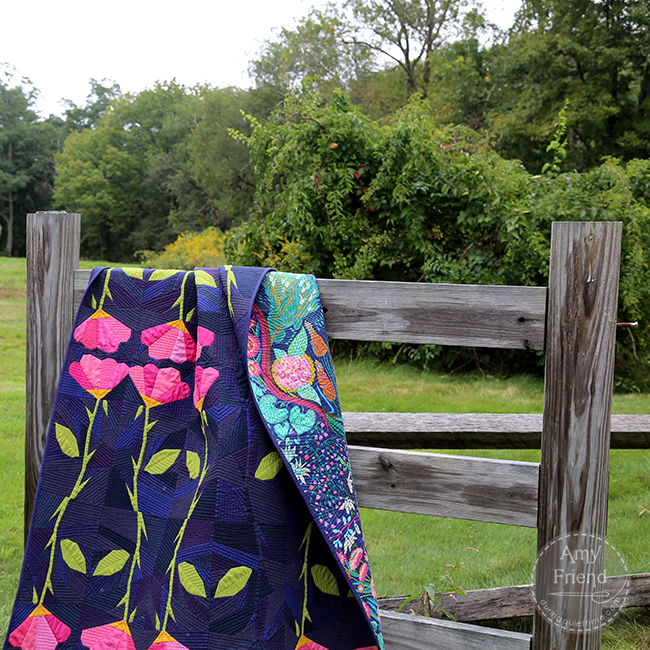 I intended to finish this quilt over the summer when there were plenty of flowers in bloom. Well, that didn’t happen because it took forever!! As a result, my dreams of quilt pictures in sunflower fields and such had to change. Fortunately, while on a morning walk, I noticed this trellis with fall blooming clematis. Isn’t it lovely? And the owner was nice enough to allow me to use this space for a photo. I spent many hours on this quilt. I noticed the texture change over time with handling and quilting. It has become so soft and pliable. I also neglected to mention that I used a black batting for the first time. I didn’t want any bearding where the white batting would be pulled to the quilt top by the needle. I was worried that the black might dull the colors of the flowers but I do not think that it did and it worked really nicely on the background. The finished quilt measures about 45″ x 60″. It was designed using EQ8 software. And yes, it’s foundation pieced (like nearly everything I make!). I will offer the pattern in my shops soon. 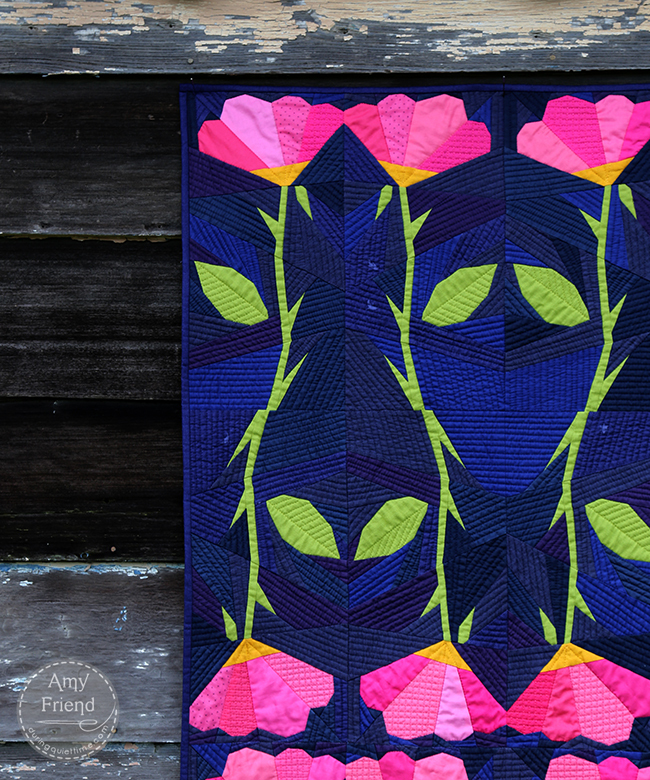 I asked for feedback on IG while I was making the quilt and it seems that most people would be happy with just the block pattern rather than a full quilt pattern. So, that’s how I am leaning at the moment. Let me know what you think too, please.